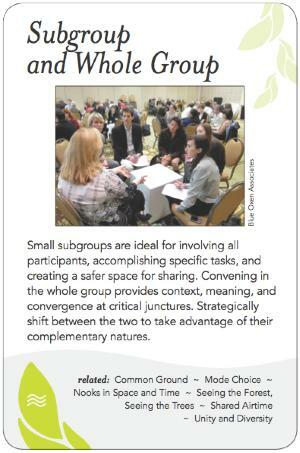 Small subgroups are ideal for involving all participants, accomplishing specific tasks, and creating a safer space for sharing. Convening in the whole group provides context, meaning and convergence at critical junctures. Strategically shift between the two to take advantage of their complementary natures. This pattern operates at multiple levels. Each level is a whole which may have subgroups, and each group can have further subgroups, down to the smallest subgroup -- one whole person. To effectively move between whole and part, the facilitator should explore and assess when, why and how to work at each level and how to facilitate the transitions and communications between the levels. For sensing and naming emerging essences, differences, consensus etc. As a safe space to share vulnerable things such as emotions, unarticulated and unformulated experiences, etc. NOTE: Breakouts are somewhat different from subgroups. They serve to concentrate shared attention and are usually informal (not deliberately established or controlled by the facilitator), and may be boundaried differently from subgroups. Alternating between the whole group and breakout activities may happen over time (everyday democracy) or in a single event (world caf?, open space); there may be an expectation or need for ongoing interdependence or there may not; they may be between strangers or people who are connected. Facilitators need to be able to appreciate and respect the value and autonomy of breakouts, but not let them disrupt the group process. The facilitator needs to assess when the group should be meeting as whole, and when to be in small groups (and how many and for how long). Subgroups can each be focused on either serial (e.g. stages in a planned program) or parallel (e.g. alternative approaches to one stage in a program). There can even be benefit in having subgroups deliberately doing duplicative activities, to allow divergence of ideas to emerge. Going to subgroups may be either pre-planned or ad hoc, and subgroups may be either assigned or self-selecting. A dramatic viewpoint / event representative, e.g. a visitor or musician, can increase the sense of collective purpose when used in larger group. Then the facilitator can transition that energy into subgroups. Scaffolding is the structure that guides participants in working together toward their goals. Good scaffolding is very clear and definite about issues like logistics (beginning and end times, writing on flip chart paper, etc) but may be deliberately vague about examples of answers groups should develop so as not to lock them into an overly specific outcome. Scaffolding is like a set of flexible tent poles across which many different kinds of fabric could be stretched but they would all be more or less waterproof. Membership - how many people in each sub-group (could be as few as one), who is in which sub-group - self-selection, facilitator decides, etc. Medium of the "report back" to the whole group (if any) - oral, written, electronic, performance, etc. Inexperienced facilitators often under-budget time for specific subgroup tasks, especially if subgroups get fairly large. Subgroup report-backs can be tiring and unwieldy, especially if the subgroup has not had time to synthesize key points before the allotted subgroup meeting time ends. Going to and from breakout rooms drains energy from small groups and makes in more likely that people will take ad hoc breaks, phone calls, etc. Where possible, keeping small teams in the same large room as the whole group meeting helps sustain energy and allows for intentional rotation of participants among groups and building ideas by 'borrowing' from each other. It's essential that facilitators, when forming subgroups, invite with integrity: Defining the purpose of the subgroups (with room for emergence) respects the energy and attention of participants. The facilitator should attend to and monitor participants' energy, which may be sapped or even crash in subgroups. Individual and cultural preferences for style of activity at different group sizes can vary enormously. Facilitators need to attend to people's sense of belonging, especially when determining a process for selecting groups. Self-selected subgroups may alienate loners and outsiders, while pre-selected subgroups may disrupt allegiances and cause resentment.